Usually when you buy a new home you get to make a few choices about the finishes. When we bought ours it was a builder spec, so all of the choices were already made by the builder, and as I've said before, it was definitely basic. No extra frills or custom features. I have been on a quest to bring in a few more custom or at least nicer details ever since we moved in. If you are redoing a home or changing a builder basic, there are a few things that you can do very inexpensively that make a big difference. I think one of the first things you can do is change the lighting. 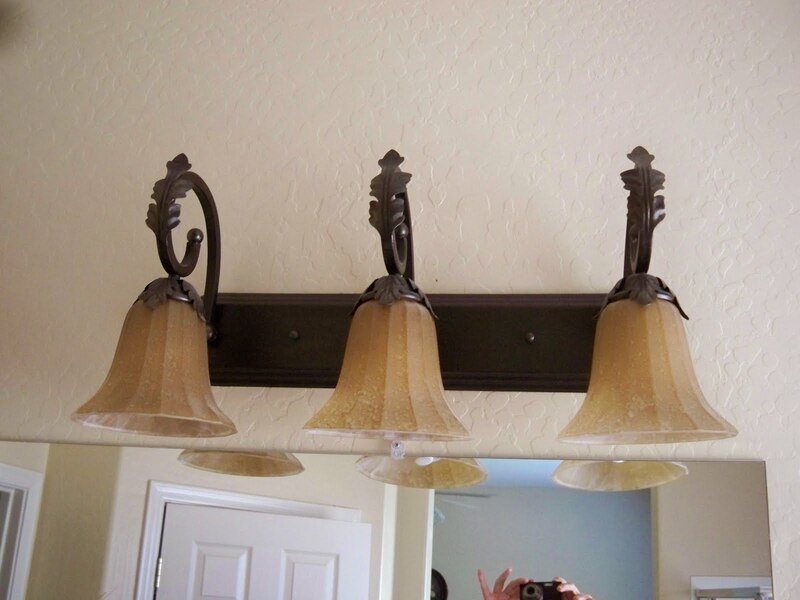 Builders put in some of the least expensive lights they can buy, and most are really ugly and just scream cheap. This is the type of bathroom lights I had when we bought the house. Home Depot sells them for $11.97. They look just as cheap and the light they offer is terrible. These were so ugly with some kind of faux striped two toned finish, but for $16.99, I thought the style and the globe was ok and I could paint them. They were well made, just a terrible finish. 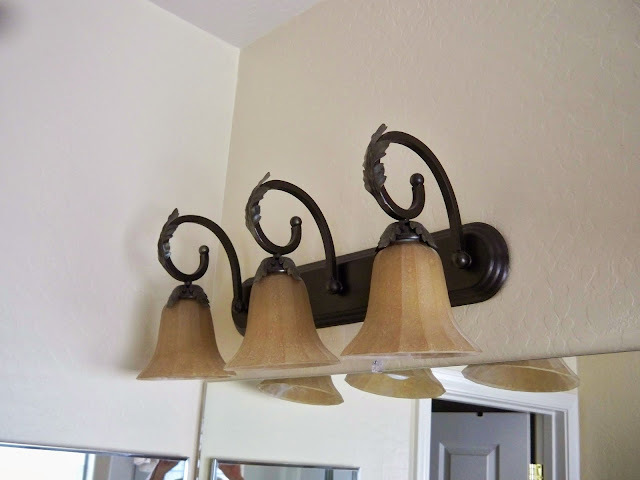 A little Oil Rubbed Bronze spray paint and I have some great looking fixtures. I also found these ORB drawer pulls at Target. They were 10 for $9.99. 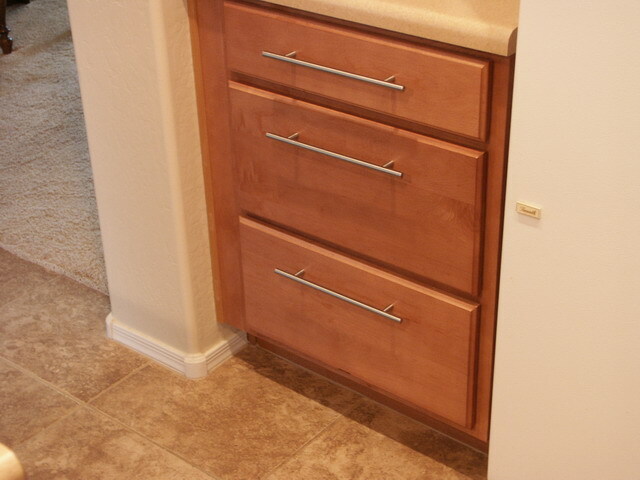 They give the cabinets a more finished look. Seems like this is another one of those lights that builders use. These run $5.97 at HD. Bedrooms, hallways and toilet areas always seem to have these beauties. 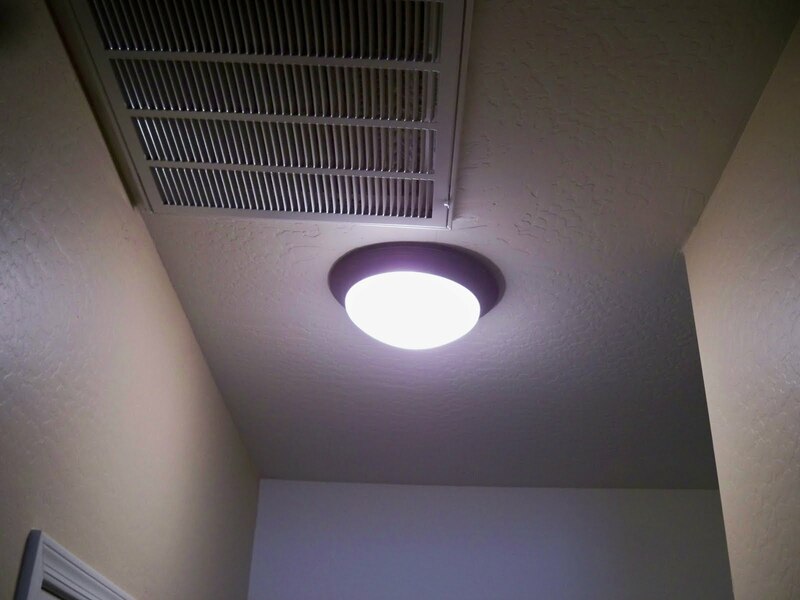 Swapping them out for a more updated flush mount makes a huge difference in the look of any room. I bought these at Lowe's for $14.97 for the halls and the toilet area in the master bath. Another area where the lighting is usually less than desireable is in the dining areas. I shopped Ebay and found this one for my dining room for $19.40. It was brand new in the box and one that someone didn't want, so they had it for sale, just click and bid. Of course we all know that yard sales and thrift stores are good sources also. This one for the breakfast area was a gift, however I found it online as a discontinued fixture and it was only $69.99. Both the dining and breakfast rooms now look so much more updated. Another area that can be updated on a really small budget is the kitchen. I wanted to add some hardware to the cabinets, however they can be really expensive. I shopped online and again found some that were really reasonable. These came from a company called Contemo Living and they were about half the price I saw anywhere else. 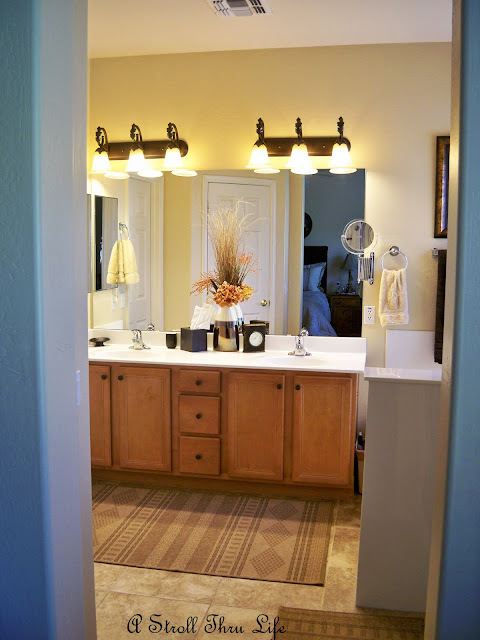 I used 3 different sizes so they would coordinate with the size of the doors and drawers. I used 6" - 8" - and 12". They cost $2.20 for the 6", $2.80 for the 8" and $3.50 for the 12". Here you can see the 8" on most of the doors, but I put the 6" on the smaller doors above the micro and the fridge. This bank of drawers is 24 inches wide, so I used the 12" here. If you're using bar handles, then coordinating the size of the handle to the cabinet or drawer gives them a custom look. 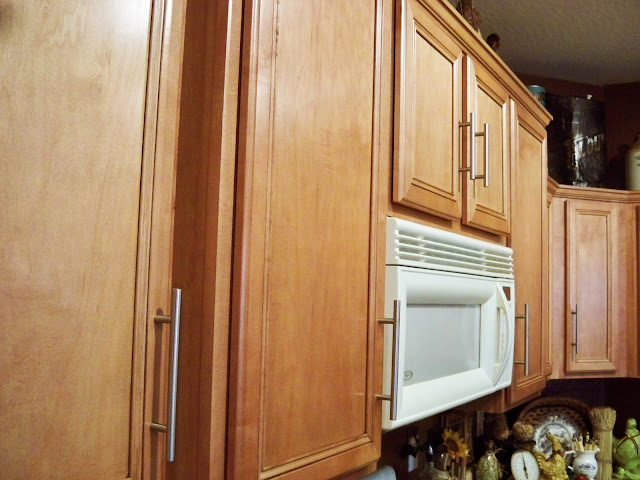 If your cabinets are really light (mine were a natural maple color) and you want them darker, you can achieve that without stripping and restaining the cabinets. I used Brie Dark Paste Wax on mine and it darkened them about 3 shades and gave them a much warmer look. If you have cabinets with a large grain like oak, you will want to test this on the inside of a door first and see if you like it. It definitely will enhance the grain of the cabinets and that may not be what you want. It totally changed the look and warmth of the maple. Even if you can't change your countertops, a new faucet will totally upgrade the sink area. I found this faucet at Overstock.com for $89. If you have priced faucets lately, you know they can run several hundred. This one is very modern and does have the pull out spray in the neck. If you are going to replace the sink like I did, be sure to shop around also. Mine came from the same place as the hardware, Contempo Living. It is an 18 guage extra deep stainless sink and was only $130. Compared to others that I saw for up to $400, this was a real bargain and it is fabulous. 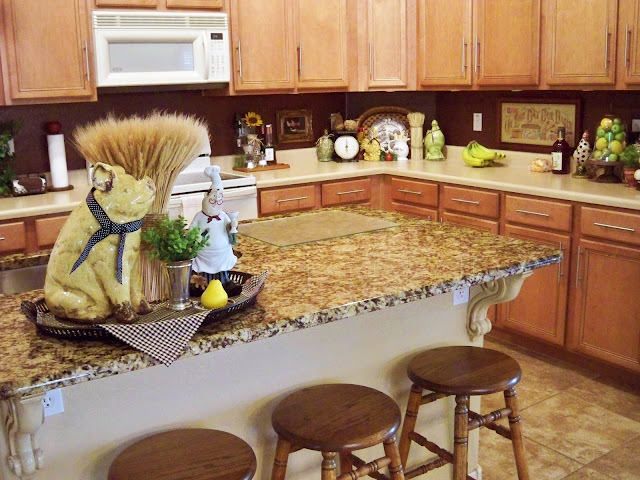 If granite is out of the budget for the entire kitchen, think about just the island. Since this is the centerpiece of the kitchen, you have the illusion of granite countertops. Most stone yards have remnant pieces that they sell at a reduced price since they are not big enough to do an entire kitchen, so you can have a small area done at a very reasonable price. Be sure to ask to see their remnants first if you're doing a small area. Another way to save if you're really on a budget is to forgo the fancy edges on the granite. 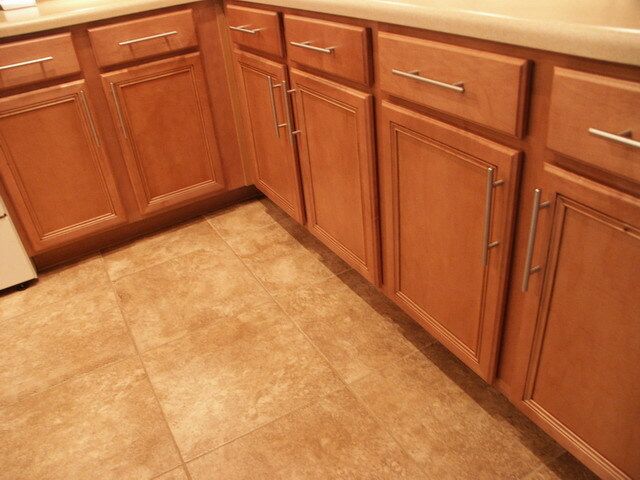 I went with the standard bullnose and it also matches better with my other counters. Also, if you match the color of the granite with the other counters, your eye just flows from one to the other. 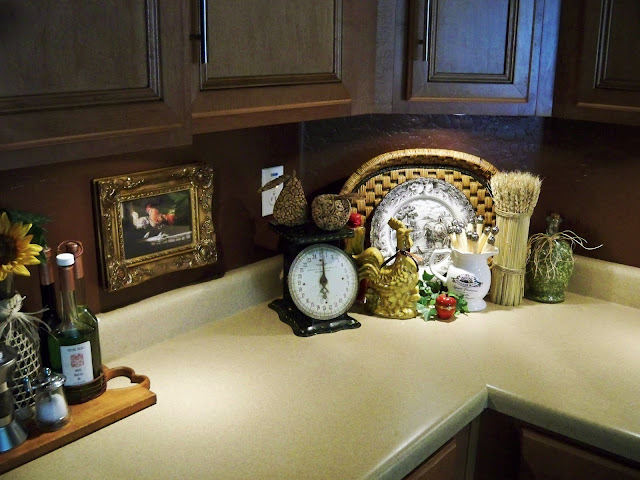 The background of my granite is a soft creamy beige that coordinates with the rest of the counters, and yet it still has enough character and movement to be the focal point of the kitchen. Pay attention to all the small details. 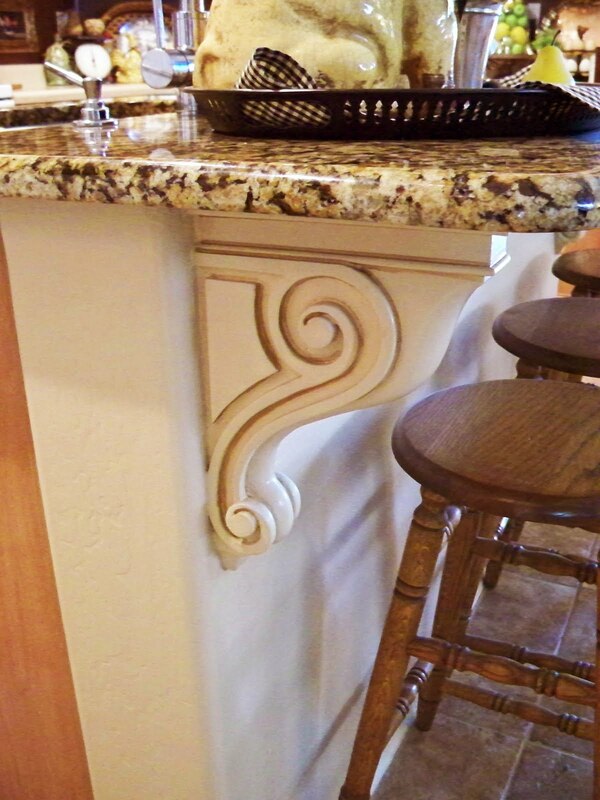 By adding these wood corbels to the counter overhang, it created a much more custom look to the island. These can be really expensive, however there are several places online that offer them at reasonable prices. Mine came from Osborne Wood Products and they are quite substantial They measure 13 x 9 x 2 7/8. For $29.99 compared to some that I saw in the $80 range of similar size. I painted them a soft camel color like the wall area and then antiqued them a little to enhance the beautiful carving details. Since these are wood, I could have stained them if the back of the island had been wood. 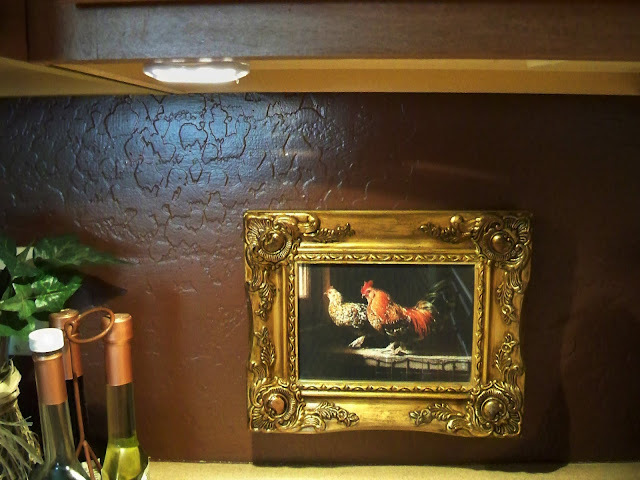 Another inexpensive and diy upgrade is undercountr lights. There are several styles to choose from. I chose the puck lights. They are really small and put off a really clean light. Even without any overhead lights, the counters are totally lit up. 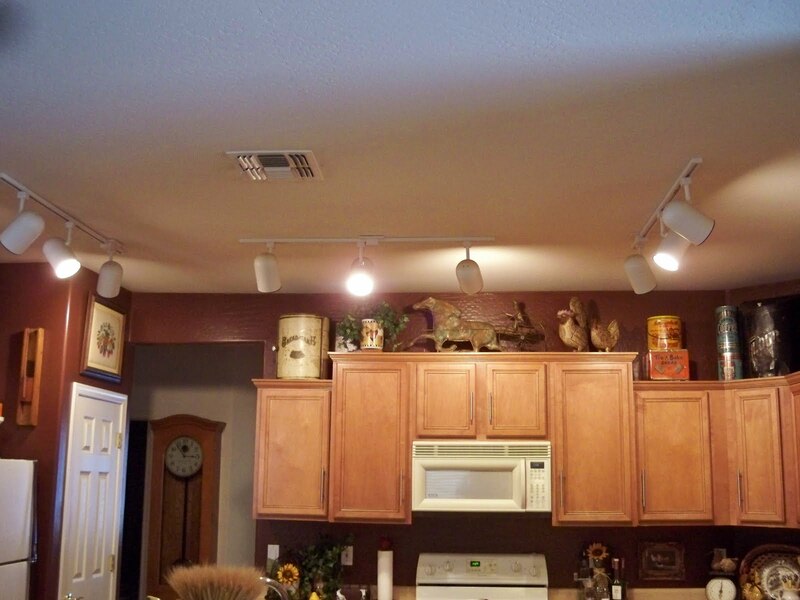 Still on my to-do list is replacing the really tacky track lighting on the kitchen ceiling. I would prefer to have the small adjustable can lights, however that is out of the hubs diy ability, but in the very least I could replace the huge cans on the track lights with something smaller. These are about the least expensive cans you can get for track lighting, so again the reason the builder chose them. I have seen some really small lights that would work on this same track and that's one possible consideration. Still deciding. If you shop carefully you can find all kinds of bargains out there. I saved hundred without sacrificing quality or the look I wanted just by carefully comparing quality and exploring all avenues available. If you are looking to update a few things, check out some of my sources, but also tell me about the ones you've found. I am not paid to endorse any of these companies, I just found their quality and prices exceptional and thought I would pass along the info. I am linking to Sherry @ No Minimalist Here for her Open House Party. Love all the touches you have added to your beautiful home Marty! It's amazing what a difference it can make! Oh Marty, thanks so much for all these helpful tips. We are in the process of purchasing a house that is about 11 years old and definitely has builder grade decor. I have been stressing on how to upgrade and make it look a little more special on a budget. You just make my life easier. I love your blog! This is a great post, Marty! I love posts that are very specific about things that you can actually do. We can all look at magazines and drool over the things we'll never actually be able to do--your post lists things that are very do-able! And what a great difference these things make! 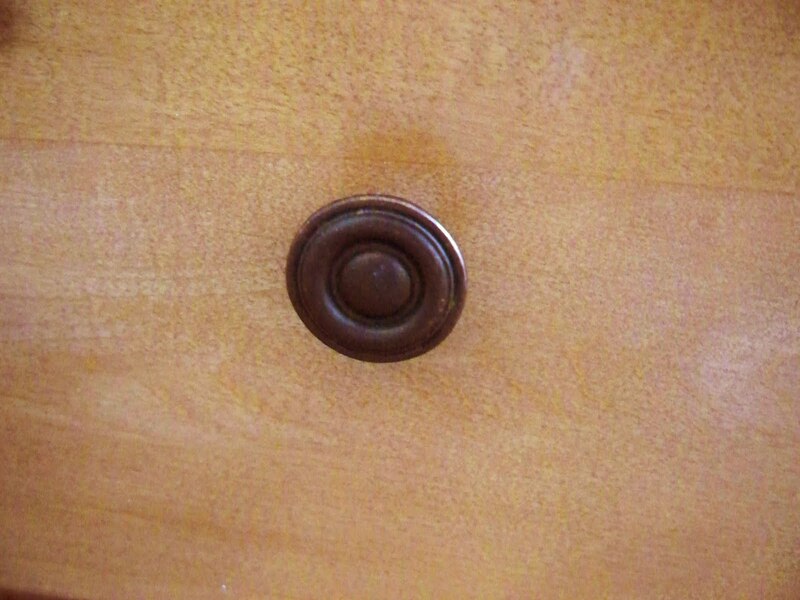 My next builder switch is going to be ORB door knobs. But I have so many, that it's gonna take time before I can afford it! Great seeds for ideas 'cause..... My house was built in 1865 & so many generations have lived in it that I just want "me" to show through! Lots of great ideas Marty. Your home always looks so beautiful and inviting. What wonderful tips Marty. I love what you did with the lighting in the bathroom, it looks very high end and perfect in there! Great tips! your home looks wonderful. Your home is lovely thru & thru. Marty, You always show us that you can have a beautiful home without it costing a fortune! This is one of the reasons I love your blog so much. Thank you for joining the Open House party and take care. I love all these ideas. 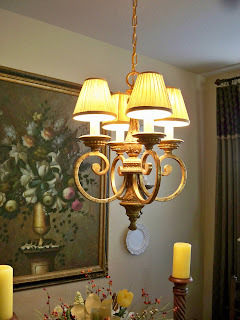 I myself am looking at new lighting in the dining and kitchen area and wanting to sand and dark stain the wood floors. Now I would love to find a cute chandelier for the kitchen with some crystals. Shopping that on-line too. Your pig is so cute! If you ever want to part with him I'll buy him from you. your so right about light fixtures! We just changed ours out in the kitchen for the 2nd time since we have lived here, looks much more updated! Love the details on your island too! Your "small" changes certainly made a huge difference. 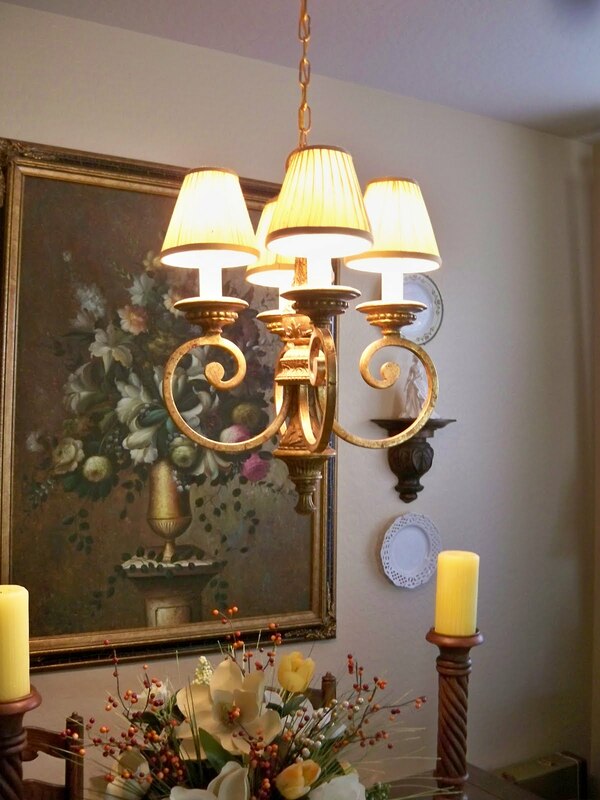 I really love all your lighting changes -- especially in your dining room and eating area. Wow Marty look at all you've done! Everything looks wonderful! I love great deals! You can really find them if you take the time! I can only dream of having a beautiful kitchen like yours someday. 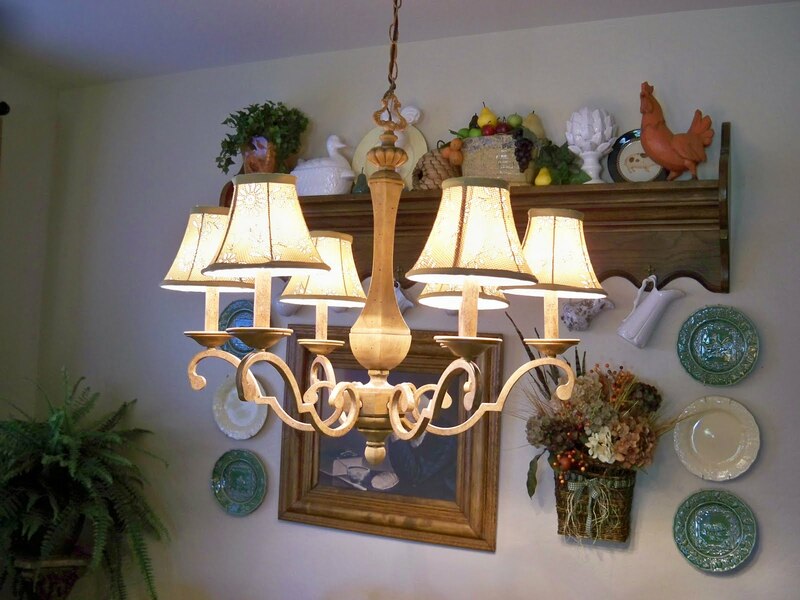 I like the dinning room chandelier so much with the little shades on it and $19.40 !!!!!! Loved this post! Do you think that dark paste wax would work on a dining table? i love your sink and cabinet hardware. it is just my style, and i wish i could do something like that. unfortunately, the previous owner's original kitchen pulls left a hole, so we had to put a backplate on every.single.cabinet, and then a handle. That chandelier is the best. Great tips. great ideas, I love your bathroom....mine is so tiny! What great ideas! You've given me great tips on how to update my home, especially the kitchen. This is the great post here..and well good thinking of this one..